For the first time in the Premier League era, the trophy was not lifted by Manchester United as Blackburn Rovers ended their 81-year wait for the top-flight title. 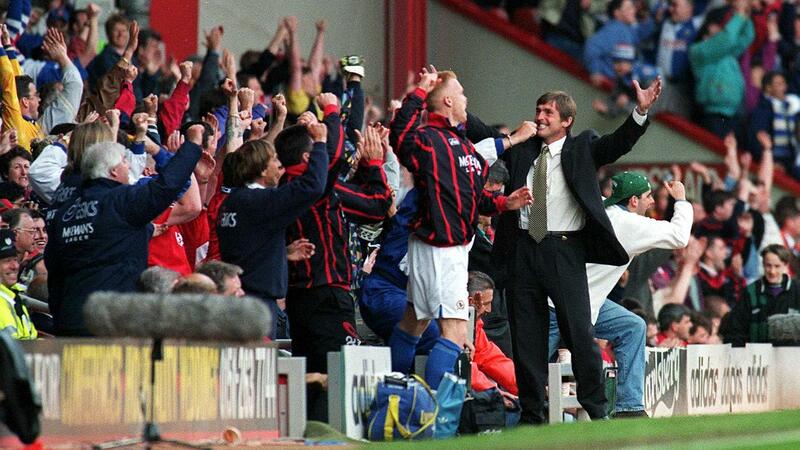 Kenny Dalglish's Rovers finished just one point ahead of Man Utd on a tense final day and, in the process, the Scot became the third manager to lead two different clubs to glory in thebar top tier. He emulated the feat of Herbert Chapman (Huddersfield Town and Arsenal) and Brian Clough (Derby County and Nottingham Forest), having already won the old First Division as Liverpool manager. 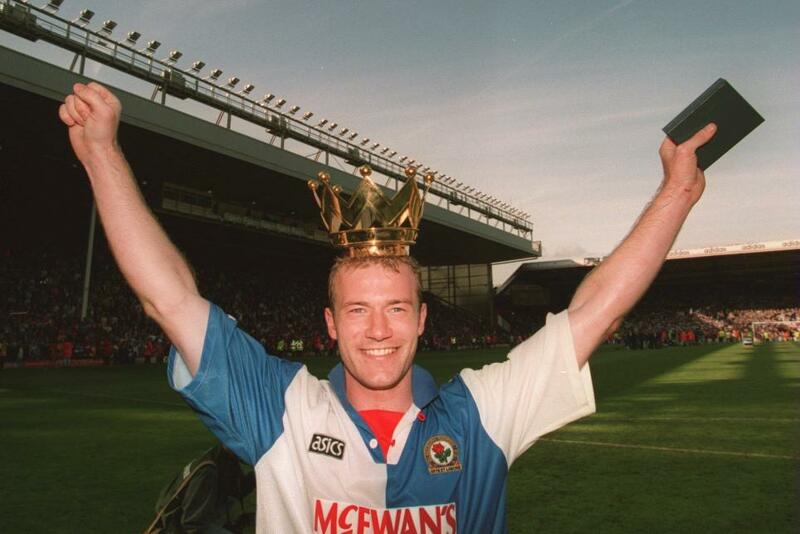 Backed by Jack Walker's heavy investment, Blackburn, who had only been promoted to the top flight ahead of the inaugural Premier League campaign in 1992/93, were inspired by the strike pairing of Alan Shearer and Chris Sutton, dubbed the 'SAS', who notched 49 league goals between them. Shearer won the Golden Boot and equalled Andrew Cole's league-high tally of 34 the previous season, while Sutton contributed 15 after his summer move from Norwich City. The Canaries were one of four teams to be relegated as the Premier League was trimmed down to 20 clubs ahead of the 1995/96 season. But, before that, a flurry of foreign imports moved to the Premier League after their exploits in the 1994 FIFA World Cup in USA. Romania's Gheorghe Popescu (Tottenham Hotspur), Netherlands striker Bryan Roy (Nottingham Forest) and Sweden's Stefan Schwarz (Arsenal) came to England, but it was Popescu's new team-mate who made the biggest stir. Jurgen Klinsmann arrived at White Hart Lane from Monaco in the summer and the Germany forward made an instant impact, scoring a bullet header in their 4-3 win over Sheffield Wednesday on 20 August, which was celebrated with a dive as he light-heartedly responded to his reputation for falling to the ground easily. The following week, Liverpool set the tone for their campaign, which was vastly improved from their eighth-placed finish in 1993/94, with a 3-0 win against Arsenal at Anfield. At 19 years of age, Robbie Fowler scored all three goals in the space of four minutes and 32 seconds, a record that would remain as the fastest hat-trick in Premier League history for some 22 years. The Liverpool-born academy graduate was the league's second-highest scorer with 25 goals as the Reds finished fourth. Newcastle United were the early pace-setters and striker Cole continued his fine form from the previous campaign. The Magpies were unbeaten in their first 11 league matches before they lost 2-0 to Man Utd, who would go on to sign Cole for a British record fee of £6m in January. Cole quickly found his feet at Old Trafford, scoring five goals in the Red Devils' 9-0 victory against Ipswich Town on 4 March. His haul was the highest ever scored by one player in a Premier League match, while the margin of victory remains the biggest in the competition's history. But it was Blackburn who wrestled top spot off Newcastle with a run of seven consecutive victories up until December, which was rounded off by a 3-2 win against Southampton at Ewood Park. The victory came despite Matt Le Tissier scoring a sublime strike from 35 yards, which was voted as the BBC Match of the Day's goal of the season. Blackburn won four of their next five matches but their undefeated sequence was halted by Man Utd, who beat them 1-0 at Old Trafford on 22 January. Eric Cantona scored the winner but played his last match of the campaign three days later at Crystal Palace. He was given a nine-month ban following an altercation with a supporter after being sent off in their 1-1 draw at Selhurst Park. The Frenchman had scored 12 goals in 21 league matches up until that point, and the Red Devils felt his absence, losing at both Everton and Liverpool and slipping to costly draws at Tottenham Hotspur, Leeds United and Chelsea. Despite three consecutive victories leading up to their final match of the campaign, United were two points adrift of Blackburn going into the last day of the season. Dalglish travelled to his former club Liverpool and Alan Shearer, who had earned a vital 1-0 win against Newcastle the previous Monday, put Rovers ahead at Anfield. 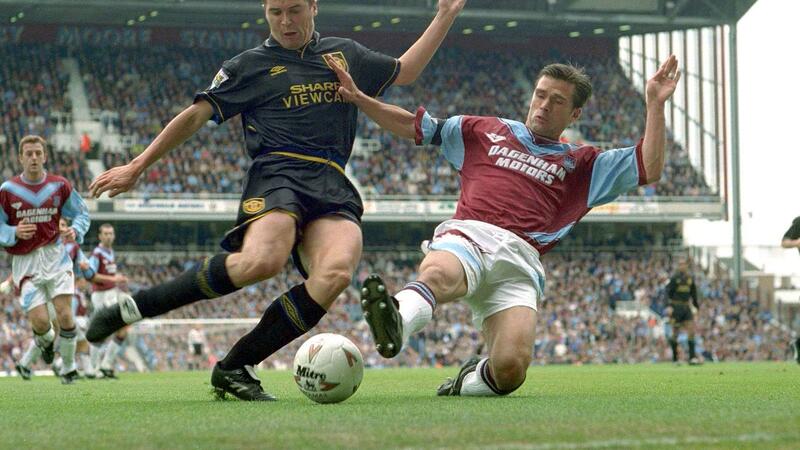 The title looked to be heading to Blackburn when Michael Hughes gave West Ham United a 1-0 lead against Man Utd. But then Brian McClair levelled terms at the Boleyn Ground, and strikes from John Barnes and Jamie Redknapp gave Liverpool a 2-1 lead against Rovers, opening the door for United. One more goal for the Red Devils would take the trophy back to Old Trafford. But West Ham goalkeeper Ludek Miklosko had other ideas and pulled off a string of fine saves to deny Sir Alex Ferguson's side the winning goal they needed. The Blackburn team celebrated on the pitch at Anfield despite losing 2-1. Man Utd finished one point adrift and promoted Nottingham Forest finished third after an impressive campaign under Frank Clark. Fellow promoted teams Crystal Palace and Leicester City immediately returned to the Championship, and they were joined by Norwich, who had finished third in the 1992/93 campaign, and bottom club Ipswich. Aston Villa, runners-up two years earlier, were one place above the drop zone. Man Utd's disappointing season was completed when 15th-placed Everton earned a shock 1-0 victory in the final of the 1995 FA Cup.